This Design Area Measures – 14″ Tall x 14″ Wide and may also Available in other Sizes. 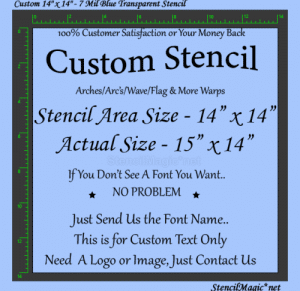 Color of the Stencils are Transparent Blue, Image Color is for Visual Effect Only.Each Stencil has between a 1/2″ to 1″ of Border in addition to the Design Size. You Can Use Our Stencils for All of Your Creative Projects.You Can Paint On Any Walls or Doors, On Wood, Cement, Furniture, Material, Frames, Tile, Scrapbooks, Floors, Lampshades, Glass And Other Surfaces, With Our Stencils You Can Create Greeting Cards, Flyers and Invitations. If Available Different Measurements will show in a Drop Down Box and are the Actual Stencil Area Design Size of the Stencil. Each Stencil has a Minimum of a 1/2″ of Border. If You Would Like a Different Size, Please contact Us and We Will Create a Custom Listing for You. INSTRUCTIONS: Depending on what you are stenciling you can spray the stencil lightly with a Re-Position-able Adhesive Spray or Elmer’s Washable Elmer’s Washable Glue Stick ™ for a Better Positioning.